If you would like to volunteer to help find Brooke Wilberger please e-mail us at: Volunteer Information For Brooke or call the volunteer number listed at: Volunteer Info..
TIME MISSING: Between 10:00-10:30 a.m.
LAST SEEN: She was last seen cleaning lamp posts in the Oak Park Apartment complex (See Map) that her sister & brother-in-law managed. Her sister left for a minute and Brooke was gone when she returned. SCARS/MARKS: Brooke has a scar extending from her right wrist to her elbow from a previous gymnastics accident. She has a piercing in the top of her right ear without an earring. EDUCATION: Brooke has completed her freshmen year at Brigham Young University as a pre-elementary education major, and has enrolled for next fall term. Brooke has been studying speech pathology, & hopes to work with children with speech impediments. She graduated last year from Elmira High School near Eugene, Oregon, where she played soccer and track. 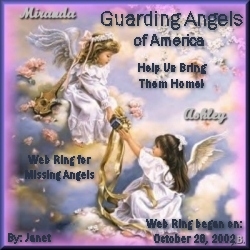 AS OF JUNE 5, 2004: As of June 5, 2004 there has been approximately 1,200 volunteers, searchers have covered more than 4,200 acres; and police have received over 1,700 tips from the community. DRINKING HABITS: Non-drinker & did not party. She is a devout Mormon who does not drink, smoke, or party. FAVORITE FOODS: Brooke loves pizza, string cheese, & the cold cut combo sandwich from Subway. OTHER HABITS: Brooke is a deeply religious girl, is an honor student, an athlete, and well-liked by friends and neighbors. She is also described as very responsible & very reliable and just a wonderful person. EMPLOYMENT: Brooke spent her freshmen year at BYU, living in the Deseret Tower dorms. She worked at a student cafeteria where co-workers describe her as very trustworthy. VEHICLE: 1999 Ford Contour (Beige). Her own car was still in the parking lot. She left behind her car, keys, and other personal belongings including her shoes and cell phone. 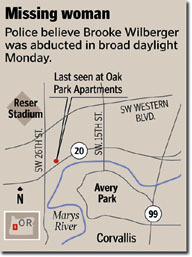 CIRCUMSTANCES: Police believe that Brooke was abducted on May 24, 2004 while cleaning outdoor lamp posts outside the Oak Park Apartments located at 1219 SW 26th Street near the Oregon State University in Corvallis, Oregon. (See Map) Her sister left for a few minutes and Brooke was gone when she returned. 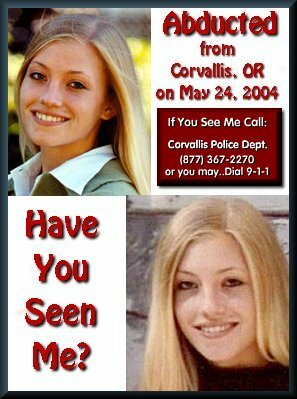 She had been visiting her sister and brother-in-law in Corvallis at the time she disappeared. The apartment complex is managed by her sister & brother-in-law. Wilberger is reportedly a very responsible, stable person with no reason to leave. There is evidence of a struggle at the scene leading police to believe she may have been kidnapped. Brooke's purse, keys, and other personal items had been left in her sister's Corvallis apartment and her car was still in the parking lot. A piece of clothing belonging to Brooke was found in the complex's parking lot. Brook's flip-flop type sandals were found in the parking lot separated by a few feet and turned to the side at an angle. Brooke graduated last year from Elmira High School near Eugene, OR where she played soccer and track. She has been studying speech pathology at Brigham Young. Brooke is a devout Mormon who doesn't smoke, drink or party. Her longtime boyfriend, Justin Blake, is in Venezuela on a Mormon mission. The family needs your assistance in finding Brooke. If you can offer goods or services that you feel would benefit the search for Brooke please let the family know. To volunteer call 541-740-3640, or feel free to fill out the on-line volunteer form. You can also send an e-mail to help@findbrooke.com. site owned by Janet/Jazzy Rose.